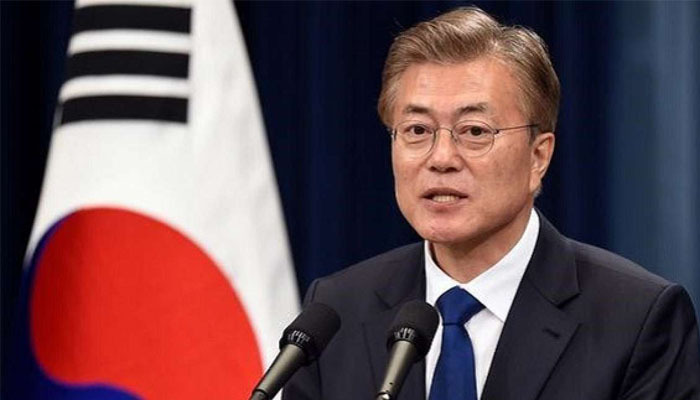 Seoul: South Korean President Moon Jae-in on Tuesday hailed the outcome of the summit between President Trump and the North´s leader Kim Jong Un as a "historic event" that ended the last Cold War conflict. "I offer my heartfelt congratulations and welcome the success of the historic North Korea-United States summit", Moon said in a statement. "The June 12 Sentosa Agreement will be recorded as a historic event that has helped break down the last remaining Cold War legacy on Earth," he said. Moon has made great efforts playing the role of mediator to bring the Cold War foes back to dialogue. He praised Trump and Kim for their "courage and determination" not to settle for "that outdated and familiar reality but to take a daring step towards change". He lionised Trump for achieving "a feat that no one else has ever delivered", adding Kim would also be remembered as "a leader who made a historic moment by taking the first bold step toward the world". "Building upon the agreement reached today, we will take a new path going forward. "Leaving dark days of war and conflict behind, we will write a new chapter of peace and cooperation. We will be there together with North Korea along the way", he said. Moon however cautioned that this was "just a beginning and there may be many difficulties ahead". "But we will never go back to the past again and never give up on this bold journey. History is a record of people who take action and rise to a challenge," he added.